Ruffle yarn of your choice – I used Fabulous Fibres Meshio in pink and purple. I worked the two meshes together. 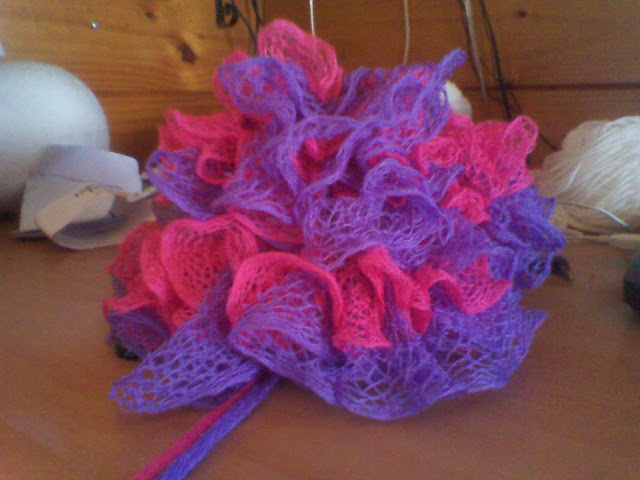 Any other ruffle yarn will work like Redheart Sashay and it is not necessary to work two together. I only did that because I noticed the Meshio was quite thin and I wanted a fuller look. Use 4.50mm hook for newborn. Use 5.00mm hook for 3-6 months. Hat height – 4.5 inches. As mentioned before I used two together but you can just use one if using a thicker brand. Brands like Redheart Sashay will have a solid edge. This will be the bottom of your ruffle. You will be working into the top. Tip: You may find it easier to wind your yarn flat around something before starting rather than doing it as you go. How to use ruffle yarn – Insert hook into the 4th loop from the beginning. Pick up every second loop onto your hook until you have 10 loops on your hook. Turn your hook and pull the last loop through all the loops on the hook. Do this over and over again until you have enough to wrap around your hat To finish off, twist the end of the yarn and pull through the last loop on your hook. A great video for this can be found here: http://www.youtube.com/watch?v=icgUxPI66KM&list=HL1353982206&feature=mh_lolz Thank you LeAnne Greene from L.A. Crochet on facebook for allowing me to use this video. Pin ruffles to the hat starting from the bottom up MAKE SURE TO KEEP COUNT OF YOUR PINS! Work in a spiral until you reach the top. Position ruffles so that the join is not showing. Did you ever finish the diaper cover with ruffle Sashay yarn? I would be interested to see how you did that. I want to make one for my little girl, before she gets too big. No sorry, if I was to do it I would do the same as the hat and sew the ruffle yarn onto the back of the diaper cover.